Windsurfing on the edge is exhausting, especially when you want to be competitive. My advice for good dayranking on gps-speedsurfing.com would be to stay in the middle when choosing gear. As known: heavy surfers need some bigger gear than lighter surfers. Also surfstyle and settings influence what is a normal sailsize for a windsurfer. Since sail manufactorers mainly focus on PWA we speedsurfers have to deal with a limited sailrange. Jumping from 5.5 to 6.2 to 7.0, for me it is clear on tight courses you have often to choose: to big or to small sail. Also you can be caught by surprise... how to perform well? To big is the safest bet for competition, but to small might have some oppurtunities which might lead to worldrecord speeds. I am better in sailing to big compared to small, when sailing competitive a big sail/board/fin it means you can keep the gear on the water. To big means often more vertical lift (at least when everything is trimmed normal). If I get to much vertical lift there are I know plenty of solutions (depending on conditions). Often I make my harnasslines a bit longer to solve the lift problem. The exhausting part of sailing to big is all the forces being bigger. 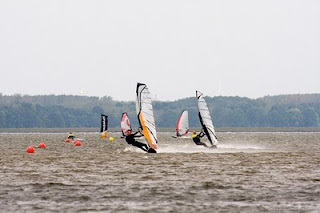 This photo (By William Breukelman) was token at Bad Hoophuizen, Falcon Speed+ RS:Slalom MK3 6.2+ Sonntag GPS_2 250. Very good wind at that specific moment, I guess 28-30kn gust. When sailing competitive a small sail/board/fin it means you have to be able to create more vertical lift than usual.. To small means often less vertical lift (at least when everything is trimmed normal). Lately I am searching to get small gear flying, but till this point I am haven't found the solution, did find and documented about 20 ways not to go faster ;). I still have a tiny little bit of hope to find it in surfstyle+tuning. The exhausting part of sailing to small is the difficulty to get the board flying, it takes much discipline for me (and therefor it is a good training). In competition so far it has never been possible for me to get small gear flying. This photo (by Rolf Aalders) was token in 10-14kn, I was sailing Falcon 91 liters+ RS:Slalom MK3 6.2+ Sonntag SL-S 34cm. Totally underpowered at any moment, biggest drag was definitly the board not able to fly at moments. See the sailangle decreasing a lot, this just to compromize in the total vertical lift picture. With this gear its possible to fly in those conditions, but it is a very very small sweetspot. 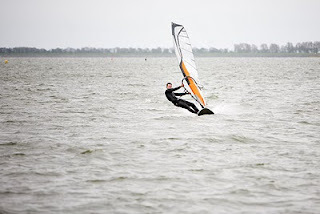 I did this day a few runs around 30-31kn, feels different to go more than twice the windspeed. My hope is to translate this to smaller gear. The biggest problem is my smaller gear doesn't function like I want, like I know how it should feel. This made me realize I should test as much as possible different gear, need some luck and lots of patience. Maybe it will sound a bit odd, but try sailing on the course with your front hand on the boom catching over not under (if you know what i mean). It will probably not be a big improvement but it will surely set the sail a bit more upright what usually helps to go a bit faster. I however feel more comfortable and more in control catching the boom under with my front hand. Another interesting post. I can understand nearly all points you have mentioned. I think the differences between too big or too small are rising if you think about board/sail sizes and not "only" about sail sizes. Maybe the differences are not too big if you are thinking about a Falcon 79 with 6.2 and a Falcon 91 with 7.0. (I don't know exactly, maybe even in this comparison the difference is huge...) But for sure the difference between a 65cm wide board with a 7.0 and a 75cm + 7.8 is huge. With this windconditions I often choose the bigger set to do much slalomracing with some nice downwindruns for the speedranking but I have no chance against people choosing the smaller set (even if I'm nearly as fast as they are if we are on the "same" set).